Everyone should experience Hot Air Ballooning at least once. The tranquil exhilaration of floating with the wind at sunrise over beautiful scenery is absolutely unforgettable. Book now! Equally thrilling and relaxing, a hot-air ballooning adventure is a pure and unforgettable experience – especially over the unique city of Canberra. Depending on the wind direction, your flight will take you over the city & lake allowing unparalleled views of the spectacular Canberra skyline, beautiful suburbs and parklands. The still morning air makes flying conditions perfect during what is known in the hot-air ballooning industry as the "weather window", a gloriously peaceful time over an often hectic city. The hot-air ballooning journey begins with a briefing by the pilot before you head to the launch site and, if you like, help prepare the hot-air balloon for flight. Thirty minutes later you'll be drifting gracefully over the countryside. The hot-air ballooning flight itself will last around one hour. After gently touching down again a hot air ballooning flight certificate is distributed to all passengers, rounding off a fabulous adventure. The icing on the cake is a glass of Champagne – the perfect way to toast your hot-air ballooning adventure. 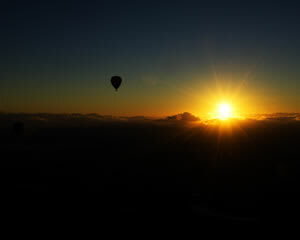 Hot Air Balloon flights take place at sunrise. The exact time of your Hot Air Balloon flight experience will vary based upon the time of year. This is a Hot Air Balloon Flight for 1 (there will be others in the balloon basket with you). An optional buffet breakfast is available after the flight for an additional cost. This may be arranged direct with the supplier on the morning of the flight. Great flight, Kym was a first class pilot. Recomend this adventure to everyone. Was a fantastic morning. Would definitely recommend hot air ballooning to anyone who visits Canberra, particularly with this company. They knew what they were talking about, were incredibly knowledgeable and did a great job. I'm terrified of heights, but I wasn't scared at all on the balloon and felt safe because I knew they knew what they were doing. GREAT SERVICE, EXCELLENT OPERATOR ON THE BALLOON. Staff were sper friendly and efficient, we felt safe and well looked after the entire time. The ballon ride was fantastic! It was a very smooth ride, I didn't even realise we were off the ground, that's how smooth it was, to be quite honest I was a little bit concerned but that concern immediately disappeared, and it was very pleasant. I totally enjoyed my balloon flight & would like to thank the balloon staff, they were great.